just as it should be, there has been no great hoo-ha made of the 25th anniversary of robert millar's king of the mountains win, and his fourth place overall in the 1984 tour de france, and i suspect that is just how robert would like it. of course, there's always folks like me punting a robert millar anniversary jersey, and drawing everyone's attention to the almost forgotten anniversary, but by and large much more was made of armstrong's entry into the giro. and that's quite likely just the way it should be. however, i drew your attention to robert's own words in the current issue of rouleur, a reason for celebration in itself, but now it gives me pleasure to note that procycling magazine has weighed in with its own tribute from the author of in search of robert millar by way of comparison between current wunderkind, mark cavendish and millar. the gist of this article (well worth reading) is that after a period of twenty-five years, another british rider may well be about to become the second to win one of the principal jerseys in the tour. having won four stages in last year's tour along with more in the 2009 giro, cavendish could well be on his way to acceding millar's throne by wearing green in paris, though i would suggest that robert's fourth place overall is safe for a good many years yet. not that i've bothered to look back through the archives (there always seems something terribly narcissistic about that), but i have a notion that last year when introducing you all to the british national bike week, that i brought up the point that i think having a national bike week is a bit of a waste of time. 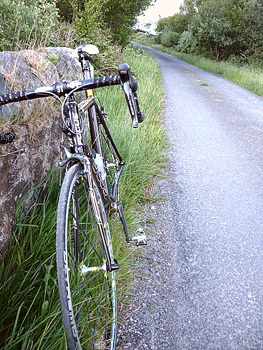 it should be (as in north america), bike month. it's not too unusual that our local council in argyll and bute favoured me with a few copies of their not entirely effective poster announcing that next week is not just any old week, but national bike week. the inclusion of a few small photos from last year's events is however, to my mind, trivialising the whole affair. certainly, we are well out of the loop over here, where bike week is given about the same degree of importance as national sandwich week (10-16 may, if you were at all interested). certainly the tube strike in london earlier this week, may just have given a neat boost to the thought of using a bicycle to get to work, ironically probably having much more effect than bike week proper. part of the problem is that concentrating everything into one week means that well meaning organisers all over the country proudly trumpet what amounts to treating the bicycle as a circus prop. basically, as i understand it, the idea is to encourage people to use the bicycle as a means of transport; perhaps not everyday, but certainly more than once a week. so why then do we only have one day of bike week denoted as bike to work day? why not make it bike to work week and provide some real incentives for this to take place. a couple of years ago, i was sent a pile of coloured spoke reflectors (very handy on a pair of mavic cosmic carbons), some balloons, and stickers, as well as a pile of leaflets to present to those taking part in our bike week events. my recent week in portland coincided with one quarter of bike month: all employees of chris king who cycled to work every day of the month of may, were rewarded with an extra two days paid holiday. it's living in a bit of a dream world to expect that to happen in the uk, but it needs something other than a bit of reflective tat to encourage the reluctant onto their bicycles. however, always assuming a decent bit of pr and the provision of some more serious incentives, 31 days is a more realistic time-frame over which to persuade civilians to use their bicycles on a regular basis. rightly or wrongly, research has shown that it takes 21 days to form a habit, which rather puts paid to a seven day bike week having the desired effect. so i figure that we lobby for extension of the time frame to the whole of june each year, and a bit more clout to bring employers on board encouraging the use of bicycles as a means of getting to and from the office or workplace. and let's drop the word national; can we please just call it bike week? of course, for some of us, every week is bike week. i have alluded to this bike over the past few days during reviews of the shimano di2 groupset and mavic cosmic carbone slr wheels with which it arrived. since this seemed like a bridge too far to encapsulate in one review, this seemed a more logical way of giving each major component series its fifteen minutes of fame. of course, any bike is only as good as its components will allow it to be; the character of a bicycle can be altered entirely by the quality of the bits hanging upon its tubes, and this is certainly more true of a bicycle which is purchased in pre-built form. any changes you wish to make to the izalco di2 would have to be made after the fact, since wiggle are unlikely to fiddle with the small bits and bobs due to the nature of their business. so, in the great wide world of carbon bicycle frames, is a focus izalco extreme the secret weapon for which you (or possibly i) are looking for? last year i unilaterally declared 2008 as the year of the handbuilt wheel; some people took notice and undoubtedly a great deal more ignored me completely. that year hasn't really ended, because i haven't altered my opinion that a pair of artisan-built bicycle wheels is the best choice a rider can make. however, not all wheels are equal, and what you expect of a wheel depends very much on what you are trying to achieve on the bike. so maybe a handbuilt, spoked wheel won't be the ideal choice for every competitive outing. if you are not involved in competition, i refer you to the start of this paragraph. however, as a self-confessed wheelaholic, anything that you can put 23mm tyres on is pretty much alright by me, though obviously some hoops are more intriguing than others. and while the number of boutique wheels on offer has seemingly increased tenfold in recent years, many of those come from companies that seem to have arrived with the sole purpose of adding to this market, and whom none of us have ever heard of. that is certainly not an accusation that can be levelled at mavic. it may well be that fewer new bicycles arrive with hubs built on to the once ubiquitous mavic rims, but the company has been astute enough to accommodate this in their business strategy, and may indeed have been the originators of the boutique trend with the release of the original ksyrium wheel. and mavic have been nothing if not pro-active in energising and monitoring the upward mobility of the trend by not resting on their laurels. in recent years i have been fortunate enough to ride deep-flange lightweight carbon wheels from germany's carbonsports, a majority of which run on tubulars; fine for the professionals perhaps, but just a tad less convenient for you or i. and while carbonsports have released a clincher version of their all-carbon wheel, the price of same still keeps it out of reach for many. mavic have, partially at least, filled the void. with wiggle listing the lighweight clincher wheel at £2899, mavic's cosmic carbone slr is a far more welcoming £865, and who's arguing about a few grams here or there? 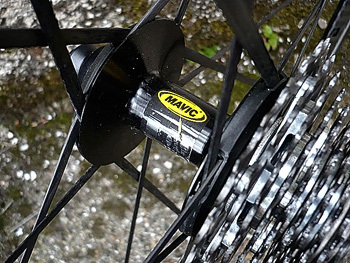 spokes are unidirectional carbon, running from rim to rim through mavic's own aluminium hubs. the spokes are not bonded in place, but the whole exists as a very rigid structure weighing a not insubstantial 1595 grams per pair, interestingly more than 200g heavier than their very own r-sys wheels. the cosmics arrived fitted to a focus izalco extreme, a bicycle that i found very stiff to ride (full review soon), so i replaced them with a pair of r-sys to find if the wheels were responsible for at least a portion of this harshness. surprisingly, to me at least, the difference was a great deal less than expected. so with 52mm carbon rims, bonded to an aluminium clincher rim and rigid carbon spokes, mavic have at least partially achieved the opposite that reputation would decree. of course you'd likely fit a pair of these wheels either for speed or for pose value; assuming speed is the principal requirement, that extra weight will certainly help rotational acceleration, with added ability to keep it there. while i would never credit myself with anything like the ability to give these wheels their ultimate workout, i will happily attest to their speed, most definitely with a tailwind, but cunningly enough, also into a headwind. the problem of course, and you could doubtless see this coming, is an islay crosswind, of which there were more than just a few during the test period. i will happily advise that if you're descending in high crosswinds, don't wear white shorts. with the front wheel only above 700g, it doesn't take much to deviate it from its chosen path, and it becomes a case of how well you can anticipate such likely deviation as to your forward or lateral direction. for that reason alone, i really couldn't recommend deep flange wheels if you live in a windy area, unless you're happy to wheel them out only in fine weather. all in all, these are fairly good value for your money, and you'd almost expect this level of equipment on a bike costing in excess of £4000. personally i'd rather opt for a pair of the r-sys wheels, not really because of their lower weight, but mainly because they are a better all-round option, and for most of us their lack of aerodynamics will be of academic interest. 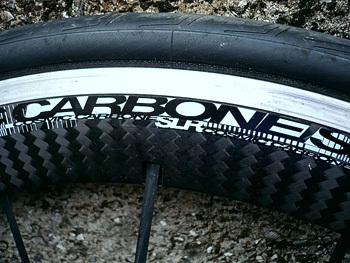 on the other hand, if you're racing, a pair of cosmic carbones might just be the armament you need to move further up the peloton. you may remember my brief tirade a month or so ago regarding the apparent claim prominently featured on the cover of mr cavendish's book. if not, i'll remind you: credited to procycling magazine, the quote reads 'britain's best ever tour de france cyclist'. if you've read the current issue of rouleur, you will be able to garner just why this is plainly not true, and which scottish climber is entitled to herald that statement. 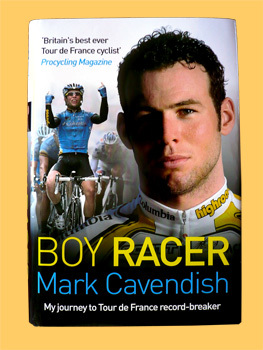 now, in mitigation, i am fairly sure that the original quote in procycling has been truncated from 'can mark cavendish become britain's best ever tour de france cyclist? ', which has a more realistic ring to it. nothing particularly unusual in that, until you realise that the speaker is mark cavendish. how many of us would have the confidence, nay arrogance, to place that kind of money on ourselves to win a stage while there were still at least a hundred kilometres to go? arrogance indeed? for those of you who have the same impression of mark cavendish as i had, you will at this point be reading comfortably, smug in the self-righteousness of your own perspicacity. only you'd be wrong, verging on very wrong. mark cavendish knows just what makes mark cavendish tick, and exactly what it is that allows him to reach that finish line a lot quicker than many of his rivals. if you have that degree of skill, confidence, assurance and a team dedicated to ensuring you achieve exactly that, the word arrogance starts to have just a smidgeon more basis in reality. and even if it is arrogance, i don't remember anyone disparaging the previous fastest man in the world, mario cipollini, for displaying the same. however, much of this is academic: from the point of view of examining this book as a volume that any of us will enjoy reading, can a youngster obsessed with barging his way through several other bicycle missiles in a 70kph scrabble, string more than a couple of words together? happily, the answer to that one is a resounding yes. this is an exceptionally well written book; well constructed, never tedious, well-paced, and above all else, highly interesting. from the give a sprinter an even break point of view, it ill behoves any of us to criticise until we know the full story, or at least the full story to date, and boy racer provides us with all the ammunition we need. ostensibly each chapter relates to a stage of the 2008 tour de france, and each is titled as such, finishing off with the winner's time for the stage and cavendish's time and position for same. more often than not, there is quite a large gap between the two. this device is probably the least successful aspect of the book, since rarely do the words within the chapter bear more than a passing resemblance to what the chapter title promises. but how many of us pay attention to chapter headings? one, two, three etc. would have been just as relevant, though it does give the author a device on which to hang the whole premise of a book who's subtitle is my journey to tour de france record-breaker. there won't be any difficulty getting to page 346; probably more of a problem putting it down in between. reading boy racer has completely changed my opinion of mark cavendish, very much for the better. i'll still hate it when the comic trumps him as being the greatest thing ever to happen to british cycling, and i'm not sure i can manage yet another sprint analysis, but those are hardly irritants that we can place at cavendish's shoes. quite a surprisingly good book, despite his not telling us what he really thinks of that columbia jersey. 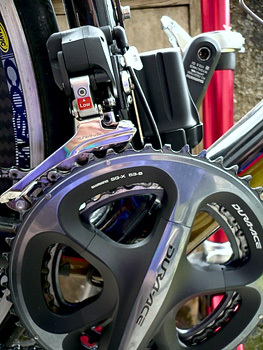 it is perhaps ironic that, less than a year after campagnolo pointedly marketed campag red shifters, shimano should bring their electronic groupset to market. the red shifters were, according to vicenza, the result of their sponsored riders requesting levers with a stronger spring, giving them a stiffer, but apparently more positive gear shift. of course, it could all have been marketing, because campagnolo themselves moved to eleven speed and the red lettering disappeared from the ergo shifters on the professionals' bikes. ironic? well shimano have removed all trace of any effort required at all, to move front or rear derailleur up and down the sprockets or rings. and with a price considerably in excess of £2000, it is likely that only the professionals (and probably the well-heeled), that will ever come to appreciate this. it does seem highly unlikely that shimano sponsored professionals are any different to those using italian componentry, so somewhare along the line i detect the intervention of a marketing ddepartment: shimano's response as to the necessity of electronics and thus a reduction in gear changing effort was to point out that several stage races and most certainly milan - san remo, reach distances that can tire even the fittest rider, and at times like these they may be less than pin sharp in their changing of ratios. i would dearly like to hear eddy merckx's reaction to that. 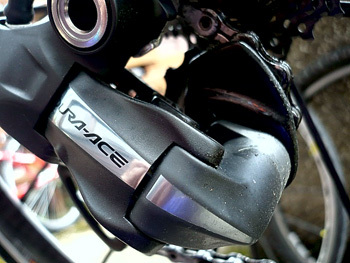 so what does shimano's dura-ace di2 accomplish that fly-by-wire systems do not? well, to be quite blunt, nothing at all. don't get me wrong, the system works beautifully; so beautifully, in fact that i have a crick in my neck from peering down at the cassette just to make sure that a change had been completed, so sure-footed and silent was the system. 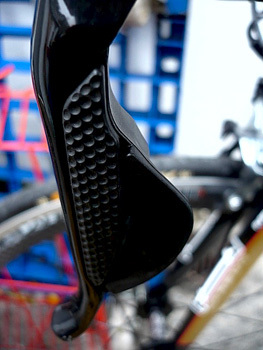 unlike the regular sti units, the carbon bladed brake lever has no lateral movement at all; upward shifts at the rear are accomplished by pressing a dimpled button on the side of the brake lever, while shifts to a smaller sprocket require gentle pressure on a bit of carbon (or plastic) pretending to be the little flip lever that appears on standard dura-ace. this latter switch has a small amount of give built in, or at least, pretends to have. in reality it only moves a short distance in making contact with the switch itself. there's not much in the way of feedback from either lever, and wearing long finger gloves doesn't do much for digital accuracy. the front changing is very impressive, coming as it does with a fabulous electronic noise as the chain moves swiftly and accurately from inner ring to outer. this bit was so cool, i was inclined to shift up and down a few times for no particular reason. the whole kit and caboodle is powered by a small(ish) battery which sits in a handy wee cradle held in place by the bottle cage bolts. 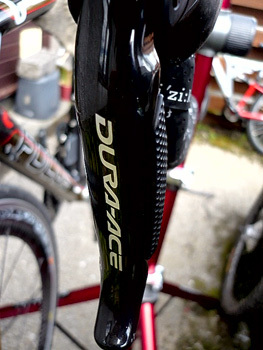 the bike on which this system was tested was a focus izalco extreme (of which more later this week) and had the battery hooked off the seat-tube bolts; it's worth noting that the bolts are still able to affix a bottle cage while employed as a battery holder. i have, however, seen one or two other bicycles fitted with di2, that place the battery on the down tube. it doesn't really seem to make a lot of difference, though the focus solution seems less ugly. there is a small switch fitted inline with the cables as they exit the bars that places the gear system in adjust mode and indicates battery level, however, try as a might, i could never get this to tell me how much juice was left. battery usage is excellent, at least it is with a new battery. i rode well over 450km before running scared and plugging the battery into its domestic charger; it took less than ten minutes to reach full-charge, so i guess it would run for a lot longer before a cold sweat took over. according to the accompanying manual, when the battery runs low, the front changer stops working first, followed soon after by the rear. it will apparently remain in whichever gear it was in when the power ran out, hearking back to last year's tour when one of the hapless gerolsteiner riders got stuck in the big ring and eleven sprocket when the battery died during a stage. unfortunately, we are unlikely to be followed by a car bearing a slew of replacement bicycles on the roof. i had, perhaps naively, expected that all would be set to perfection on rolling the bicycle out of its very large box, and therefore simply climbed aboard and set off into the hinterlands. sadly this turned out not to be the case, with the chain sitting just at the point of wanting to find a new home on an adjacent sprocket. indexing has never made this a quiet affair. so, bereft of a barrel adjuster on the svelte rear mech, how does the boy racer go about lining everything up properly? that small switch incorporated into the wires at the front of the bike is the key to everything: put the chain into sprocket number five, press the tiny button until a small red led illuminates, then press either button on the brake lever to achieve minute calibration. in practice, this was remarkably easy; i managed while standing at the side of the road, rather than having to place the bike on the workstand. despite having swapped wheels about on the focus, i've never needed to adjust it again. my first couple of rides were in customary islay rain, yet despite the battery sitting in a position where any precipitation was likey to drip into the contact area, it never missed a change, front or back. mavic are likely yellow with envy. i believe some team bikes are being delivered with appropriate holes in the frame to allow internal routing. the focus had no such provision, but the gear wiring was very stealth like and unobtrusive. the only rather incongruous feature was somewhat ugly and empty looking cable stops on each side at the top of the down tube. to be fair to focus, this particular frame is also available (at the same price) with campagnolo super record which will obviously need those cable stops. perhaps the only mystifying point about such an electronic system is why they have remained faithful to the old positioning of gear change points; there is obviously a need for those to remain, but would it not have been easy, simple and forward thinking to have placed anothe couple of switches under the top of the bars, so that changing could be accomplished when in the characteristic robert millar climbing posture? di2 works very well indeed, but then so does standard dura-ace at a far lower price, and with little or no chance of needing to be re-charged. if you're of a nervous disposition, i'd nip off and make an espresso while i relate the numbers: brake/gear levers £500; rear mech £490; front mech £370; front cables £85; rear cables £140; battery £ 60; charger £56. total price £2400. nicely done, but to my mind, it's a solution looking for a problem. 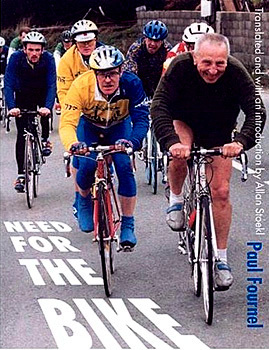 paul fournel is currently the french cultural attache in london, a position he successfully combines with his status as a prolific author, having published a grand total of 21 books, the latest being meli velo, a dictionary of french cycling terms. however, amongst the cycling cognoscenti, he is renowned for his book of essays besoin de velo or need for the bike, translated by allan stoekl. a friend in colorado sent me a copy of this book as a present last year, and several of the essays have been published in past issues of rouleur magazine, usually accompanied by particularly fine illustrations by mr mint sauce, jo burt. 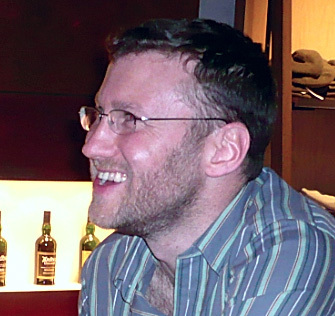 by a happy series of coincidences this past week, proving, if proof were needed, that it's very much a case of not what you know but who you know (thank you mr seaton), i was put in touch with mr fournel to ask if he would be willing to subject himself to a washingmachinepost interview. happily, the answer was a very positive yes, and proving this enthusiasm to comply, i received the answers the following day. believe me, it's not often that happens. life's not all a bowl of ceramic bearings for a reviewer of cycle goods and bicycles. today was most definitely hi-tech day, heading out early(ish) on a focus izalco fitted with shimano di2, and wearing the latest in technical cycle wear from mavic, pretty much head to toe. you'll have to wait a day or two to read the reviews relating to this stuff (one has to carefully consider just how cool and modern one looked and rode), but suffice to say that this was not the first ride for either item of trendiness, but certainly the first long ride. or at least, that was the intention. while most of you can head into the hinterlands for uninterrupted pedalling, save the all important coffee and cake, us professionals (did i hear a guffaw at the back?) have to stop along the way to take strategically dramatic photographs. what would ben ingham do? bizarrely, at the first of those stops, the rear wheel punctured while momentarily left unattended, but sitting on grass. when replacing the tube, i could find nothing in the tyre that might have caused such rapid egress of air, so with home not a million miles away, i returned just long enough to grab another spare tube, and push the pressure up with the track pump, before continuing with testing, albeit on a shorter route. the advantage of the latter was an earlier eta at debbie's for a quadruple espresso soya cappucino (at least i think that's what she said). we're sort of into summer now, so supping of coffee and munching of carrot cake is partaken by several more than has been the case prior to now, so i was lucky to nab a solitary chair. a bright, sunny day on islay you would think would offer the opportunity to dine al fresco, but this must be one of the few places where bright sunshine does not guarantee high temperatures, even in june, and there's that perennial wind (reaching well over 40kph today). so it was that i elected to remain indoors. wearing a chris king cap, a full set of mavic altium clothing and a pair of bright yellow mavic zxellium shoes, it is unlikely anyone mistook me for the local gardener, but it was still a nice surprise that an elderly gentleman pulled his chair round to my table and brought his cappuccino with him. he enquired about the type of cleats that were on the soles of those bright yellow shoes remembering that in his day, shoes bore nailed in cleats for use with toe-clips. 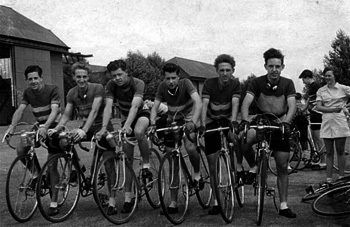 and he then told me about his years of cycling in a club during the war, when traffic was less busy than it is currently, but that the hardest obstacles to deal with were slow moving army convoys. he rode a raleigh steel bicycle fitted with cane rims and tubular tyres, and asked whether i was riding high pressure tyres or tubulars, pointing out that in those days they used to wear a spare tub crossed over the torso in case of a puncture, just as we've seen in those old black and whites from the tour. when we ventured into sturmey archer territory in the days before derailleurs were readily available, i was almost embarrassed by the focus sitting outside with its large carbon tubes and electronic gears. but the truly serendipitous part of this most enjoyable encounter was when recounting his visit to a local cycle shop, he mentioned being welcomed as pedaller palmer. not sure that i'd heard him correctly, i asked if he'd just inferred that his surname was palmer, at which point we discovered that not only were we both in love with bicycles, but shared a common surname. how cool is that? sadly, joe's last bike went up in flames when his wife's car caught fire in their garage, and as yet, has not been replaced. he must have been in his late seventies or early eighties if he was cycling in a club during the war, but the mind was as clear as a bell. so chapeau joe palmer from the wirral; i enjoyed our all too brief encounter. the gear and equipment might have altered by quite some measure since the mid-forties, and i was probably riding and wearing most of it, but being a cyclist has not changed at all. thank you for joining me for a coffee.